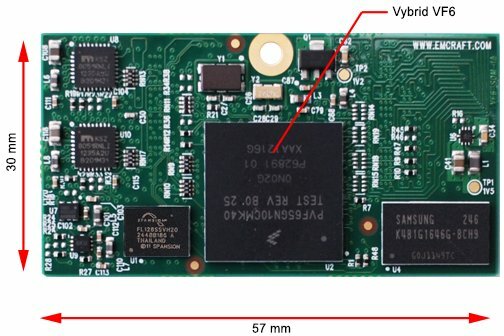 Emcraft Systems has recently announced Vybrid VF6 SoM, a System-on-Module powered by Freescale Vybrid VF6 dual core Cortex A5/Cortex M4 SoC with 128MB DDR3, and 512MB Flash, as well as a starter kit composed of VF6 SoM and a carrier board. 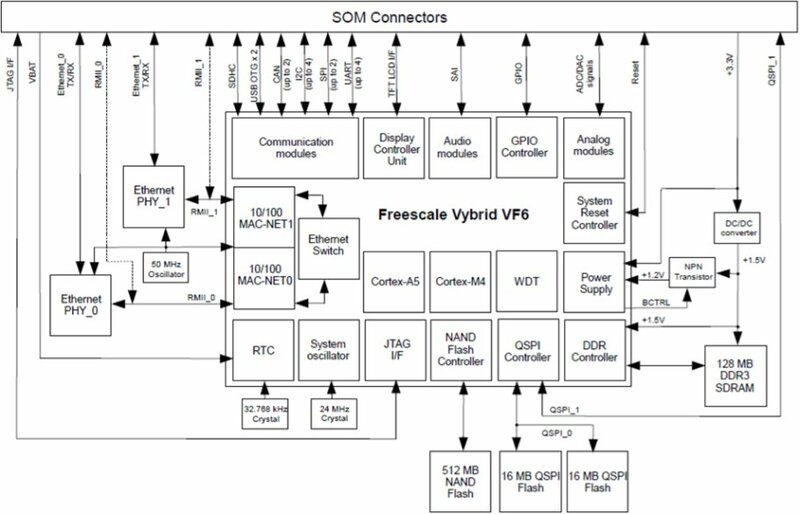 SoC – Freescale Vybrid VF6 dual-core microprocessor with the ARM Cortex-A5 (up to 500 MHz) and Cortex-M4 cores (up to 167 MHz). Either MVF61NN151CMK50 (No Security), or MVF61NS151CMK50 (with Security). 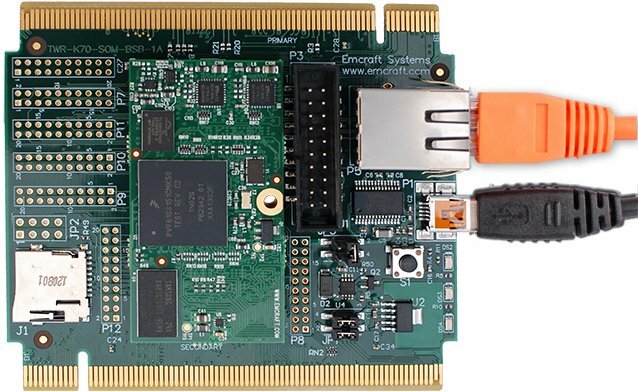 Emcraft supports Linux as an operating system for the Vybrid Cortex-A5 processor core and MQX as an RTOS for the Cortex-M4 processor core. The company provides a starter kit guide publicly, as well as a software development environment (U-Boot firmware, Linux kernel, busybox and other target components, a Linux-hosted cross-development environment for both Linux and MQX, and a framework for developing multiple projects including sample projects), and pre-built Linux and MQX images for download to their customers in VF6-SOM software page. VF6 SOM Starter kit is composed of VF6 SOM board, TWR-VF6-SOM-BSB baseboard, and a Mini-USB cable UART/power interface. It can be used in standalone mode, or as part of Freescale Tower system. VF6 SOM is available now and pricing starts at $49 per unit in 1k unit quantities for the low-end configuration (128 MB RAM, 128 MB NAND Flash, 1x Ethernet PHY). The starter kit is available for $179. You may find more information on Emcraft VF6-SOM page.